(Stanford, 2009) xiv + 283 pp. Reviewed by Beth Lau on 2009-09-01. This book is a learned, provocative study of attitudes and writing about marriage in the Romantic period, focusing on Wordsworth's and Austen's post-war publications. In the past, marriage in the Romantic era has most often been treated as an issue in the works of women writers struggling with restrictive gender roles and patriarchal culture. Walker, by contrast, argues for the centrality of debates about marriage in the society more generally, for both men and women. He notes how pervasive anti-conjugal writings were at this time, with attacks coming from figures such as Godwin, Wollstonecraft, Mary Hays, P. B. Shelley, and Byron. Walker's emphasis is not on the 1790s radical movement, however, but on the Regency period, when the end of war was expected to usher in a heyday for matrimony, much like that which followed the end of World War II. War, after all, divides couples, but peace should "make the world safe for conjugality" (71). In fact, however, marriage remained unstable and contested after Waterloo, a fact most dramatically conveyed by the "bad marriage" of the couple "at the apex of establishment culture," the Prince Regent and his wife Caroline, whose seamy affairs "roiled . . . to notorious boil in the divorce trial of Queen Caroline in 1820" (2). Walker acknowledges the obvious differences between his principal subjects. Austen "ducks marriage in her own life and appears to write about nothing else," whereas Wordsworth "seems to have disappeared into marriage but appears never to write about it" (3). According to Walker, however, the works of both writers express a similar point of view toward marriage, which he terms "indifference," a stance that "confesses itself in a variety of forms perplexed, stymied, or otherwise balked by the nuptial, for better or worse" (6). Walker draws on a variety of sources for the term "indifference," including a 1787 poem "To Indifference" by Ann Yearsley, a fascinating allegorical map of marriage by Anna Barbauld (which supplies the cover art for the book), Schelling's 1804 "System of Philosophy in General," and a passage from Sense and Sensibility. Walker insists that indifference is neither pro- nor anti-conjugal, both of which attitudes remain within the "marriage system," but instead is a position that attempts to situate itself outside the prevailing culture of compulsory conjugality altogether (7, 23). 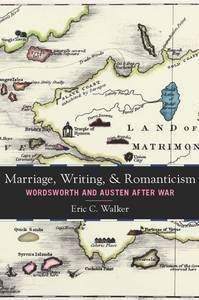 Despite Walker's insistence on this point, however, his analyses of Wordsworth's and Austen's texts appear chiefly to highlight reservations about or challenges to prevailing concepts of matrimony. It remains unclear to this reader how precisely indifference differs from opposition or at least ambivalence. Chapter 2 traces indifference and other marriage theories in the works of figures such as Hegel, Kierkegaard, and Schelling in the nineteenth century and Adam Phillips and Stanley Cavell in the twentieth, the latter of whom Walker finds especially useful to his own approach. For Cavell, "the chance for happiness" in marriage requires "the mutual acknowledgment of separateness" and "the willing repetition of days, willingness for the everyday" ("The Uncanniness of the Ordinary," qtd. 42). The fact that marriage involves the repetition of daily interactions means-in Walker's paraphrase of Cavell-- that there "is no such thing as marriage, but only remarriage, again and again" (223). Moreover, the repetitious nature of marriage, along with the fact that society considers it the only life choice, renders it paradoxically unavailable for representation; marriage a la Cavell is both "the only tale to tell" and "a tale that is untellable" (5). Walker's methodology combines these marriage theories with relevant historical and biographical information and a close reading of literary texts that teases out the implications of key words. For Austen's novels, he explains, he relied on electronic search engines to identify patterns of diction, syntax, and grammar in ways not possible with traditional print concordances (4). For Wordsworth's poems he compared in detail the multiple drafts presented in the Cornell editions of them. As mentioned previously, Walker notes that Wordsworth is generally thought to have slighted marriage in his poetry. He is considered the voice of the solitary individual or of the nation or tribe but not of the conjugal pair. Even after the 1981 publication of The Love Letters of William and Mary Wordsworth revealed the couple's passion, few scholars have explored the significance of Wordsworth's marriage for his poetry. Walker argues for pervasive references to marriage in the post-war verse, chiefly poems from The River Duddon, a Series of Sonnets; Vaudracour and Julia; and Other Poems, published in April 1820. Walker calls this the poet's "'third volume' book of marriage" (9), alluding to the Advertisement's claim that "This Publication, together with 'The Thanksgiving Ode,' Jan. 18. 1816, 'The Tale of Peter Bell,' and 'the Waggoner,' completes the third and last volume of the Author's Miscellaneous Poems." Oddly, just a few months later, in July 1820, this work was superseded by a new four-volume collected edition, The Miscellaneous Poems of William Wordsworth. As a result, the April 1820 volume remains "one of the most fugitive books Wordsworth ever produced" (66); only seven copies are extant today, and the work has seldom been treated by commentators. According to Walker, this volume fleetingly refers to a variety of marriages and other unions, including those of "Arthur Wellesley and Kitty Pakenham . . . Caroline Wordsworth and Jean-Baptiste Baudouin . . . Samuel Taylor Coleridge and Sara Fricker, the first attachment of William Wordsworth and Annette Vallon, [and] the subsequent attachment of William Wordsworth and Mary Hutchinson" (67). The references to these relationships are often subtle, elicited through careful interpretation of significant details, but for Walker their very elusiveness typifies "a poetics of indifference" (67). For example, the poem "To -----," which Walker treats in both chapters 2 and 6, calls on a female companion, whom Walker identifies as Mary Hutchinson Wordsworth, to rest on an exposed, elevated ridge beneath an ancient oak described as an "obnoxious tree." Walker explains that "obnoxious" is used in its older sense of "exposed to harm" or "at risk" (68). The speaker also refers to a cluster of leafy trees along a stream below them, an image commonly associated with the ease and embowering shelter of marriage. The fact that the poem situates the couple not in the shady vale but on higher ground under an "obnoxious tree" replaces the "rest" of marriage with "risk"; the poem thus "foregrounds and challenges the trope of marriage as domiciliary refuge, as bower of bliss" (67-68). In chapter 2 the analysis of "To -----" is introduced with a fascinating survey of biographical and historical information that begins with Wordsworth's appearance in two paintings, Benjamin Robert Haydon's Christ's Triumphant Entry into Jerusalem, finished and displayed in 1820, and James Stephanoff's watercolor of the November 10, 1820 divorce trial of Queen Caroline. In both of these paintings, Wordsworth appears to be an "icon of fidelity" (62), contrasted in the first one to Voltaire and in the second to the scandalous royal couple. Wordsworth's image as an upholder of conservative values, however, is undercut by the fact of "another Caroline," his illegitimate daughter with Annette Vallon, whom William, Dorothy, and Mary Wordsworth had just visited in Paris in October 1820 on their way home from a tour of the continent (62). This was the first time Mary Wordsworth met Annette and Caroline and the first time Wordsworth met his daughter's husband and two children, his first grandchildren. The tensions in these various relationships and their resonances in a number of poems, journals, and letters are skillfully traced by Walker and linked to the more public marital contests occurring at the time. On occasion the connections Walker draws between Wordsworth and other figures may seem merely coincidental rather than biographically or historically significant (e.g., the fact that Maria Fitzherbert, whom the young Prince of Wales secretly wed, was in Paris in October 1820 while the Wordsworths were visiting there ). Generally, however, the links explored between the poet and other people or events effectively situate Wordsworth's own complex position on marriage in relation to similar conflicting attitudes and practices in Regency society, often in surprising and revealing ways. Walker's practice of noting elusive references or conspicuous absences in Wordsworth's poems recalls the methods of New Historicist critics such as Marjorie Levinson and Kenneth Johnston. Whereas those critics argue that Wordsworth omits or downplays references to public, political events, however, Walker emphasizes the personal, familial implications of verses that do not ostensibly treat such matters. For example, Walker argues that Thanksgiving Ode (1816), presumably written to celebrate Wellington's victory at Waterloo, contains as a "buried field of reference" his daughter Caroline's February 28, 1816 wedding, which Wordsworth did not attend (77-78). Just as the sections on Wordsworth's poetry explore complex, ambivalent (or "indifferent") treatments of marriage, those on Austen's novels highlight the ways in which "picture[s] of [marital] happiness"(46)-a phrase from Persuasion referring to Admiral and Mrs. Croft--are questioned or unsettled. For example, although the Crofts appear to be a model couple in Austen's oeuvre, Walker notes a number of details that cast doubt on the felicity of their union. Louisa Musgrove enthusiastically admires the Crofts' lifestyle and relationship, but she is hardly the spokesperson for marital values in the novel. Walker closely analyzes several key passages on the Crofts, including the statement that Mrs. Croft would "walk for her life, to do [the Admiral] good," which suggest an imbalance in the couple's apparent equality, privileging the husband over the wife (53-56). Thus "even this (ideal?) marriage offers only the appearance of mutuality, a façade that still demands the subordination of wife to husband, and as such it is only a new form of imprisonment to deceive young victims such as Louisa Musgrove" (53). The two most focused and unified chapters and the ones that draw the closest parallels between Austen and Wordsworth are the fourth on "Marriage and Siblings" and the fifth on "Marriage and Friends." In the fourth chapter, Walker notes that both Wordsworth and Austen were especially close to their sisters, but in the works of both (and in the life of Wordsworth) close sibling relationships are eventually supplanted by conjugal unions. Thus in Mansfield Park William Price must be shipped out twice in order for Fanny to marry, and language used of the Dashwood sisters in Sense and Sensibility reappears in Persuasion to describe the romantic reunion of Anne and Wentworth. The section on Wordsworth in this chapter skillfully traces passages originally referring to Dorothy Wordsworth through multiple drafts, to the point where the material splits in two directions. In the 1820 "third volume," some of it goes into "Ode to Lycoris" and "To the Same," both addressed to Dorothy, and some goes into "To -----," now addressed to Mary Hutchinson Wordsworth. This "mutagenic" split (127) in the evolution of verse drafts signals Wordsworth's capitulation to "postwar . . . pressure" to replace the sibling with the conjugal pair, a shift that is nonetheless attended with a measure of "indifferent" perplexity and elegy on Wordsworth's part (124-25). The fifth chapter similarly argues that friendship is usurped by marriage in post-war British culture. Walker demonstrates this pattern at work in Wordsworth's "poem to Coleridge," The Prelude, "one of the most important documents of friendship in Romantic writing" (131). In multiple drafts of key passages in The Prelude, however, references to Coleridge become less upbeat, and in various ways marriage assumes more prominence and friendship less. As always, however, the representation of marriage is complex and troubled, as reflected in the tale of the star-crossed lovers, Vaudracour and Julia. Originally part of the 1805 Prelude, the Vaudracour and Julia episode was removed from that work and published as a separate poem in the April 1820 collection. Walker considers Vaudracour and Julia in relation to the other narrative poems with which Wordsworth linked it in the Advertisement to his 1820 volume: Peter Bell, whose title character is a polygamist, and The Waggoner, whose protagonist leaves his wife and child asleep in his wagon while he carouses with a discharged soldier in an inn. In particular, Benjamin the waggoner leads a toast to Admiral Nelson, notorious for his adulterous affair with Emma Hamilton. Thus "Wordsworth's 'third volume' book of marriage . . . collects a remarkable set of broken and abandoned pairings, historical and fictional" (158). In the Austen section of chapter 5, Walker describes two forms of the modern ideal of companionate marriage, a closed form in which the couple is all-in-all to one another and excludes others, and an open form that includes friends (160). Charlotte Lucas in Pride and Prejudice conspicuously chooses marriage over friendship, and Walker notes how Charlotte subsequently declines in importance not only to Elizabeth but also to the narrator, until she becomes the only major character not mentioned at all in the final chapter of the novel. In Persuasion, by contrast, Anne's friendship with Mrs. Smith not only revives after a lapse of many years but survives Anne's marriage to Wentworth, and Mrs. Smith figures prominently in the concluding paragraphs of the novel. Walker nonetheless resists reading Persuasion as an untroubled celebration of open companionate marriage, even though he admits that this is "a plausible construction of" the evidence he has presented (174). He finds "much that is odd" about the recurring references to Mrs. Smith in the novel's conclusion and insists that Persuasion "digs in its heels against pressures both to rule friends out of the conjugal frame or to blend them without hitch into the companionate marriage settlement" (175, 174). Walker doesn't note that Austen directly parodies the closed form of marriage or courtship which excludes others in both her juvenile Love and Freindship [sic] and in Sense and Sensibility. Also, Deborah Knuth in "Sisterhood and Friendship in Pride and Prejudice: Need Happiness Be 'Entirely a Matter of Chance?'" (Persuasions 11 : 99-109) argues that Elizabeth differs from Charlotte Lucas by retaining or gaining close female friends (her sister Jane and sister-in-law Georgiana) when she marries. Although in chapter 4 Walker acknowledges Jane's and Elizabeth's intimacy (in order to contrast the absence of close ties between sisters in the later novels), he does not mention the Bennet sisters' relationship in chapter 5's discussion of open and closed marriages. In general, Walker's literary approach is microcosmic rather than exhaustive, with each chapter closely analyzing a few key passages from selected works. These analyses are usually insightful and relevant to the topic at hand, but at times one wishes for a more sustained reading of a novel. In addition, the weight of meaning Walker ascribes to certain words and phrases sometimes seems unduly subtle and may strain credulity (such as his analysis of references to "sinking" in Sense and Sensibility and Persuasion). In spite of these reservations, Walker's arguments about Austen's work will probably be more accessible and possibly more influential than his analyses of Wordsworth, which treat rather obscure poems and rely on elaborate tracings of textual variants. These arguments are illuminating and well-supported, however, especially when combined with the biographical and historical information with which they are contextualized, and Walker overall makes a convincing case for the significance of marriage in Wordsworth's post-Waterloo life and work. Perhaps others can follow Walker's lead and find further subtle but powerful references to marriage in poems not hitherto thought to address this topic. Marriage, Writing and Romanticism persuasively establishes marriage as an important issue in Romantic culture, bringing into focus many examples of problematic unions both overt and covert, public and private, historical and literary. The book joins other recent works that have argued for Austen's affinities with canonical Romantic writers (e.g., Clara Tuite in Romantic Austen ; William Galperin in The Historical Austen ; William Deresiewicz in Jane Austen and the Romantic Poets ; and I myself in a number of essays), and Walker contributes substantially to our understanding of ways in which the age's greatest novelist participates in debates and movements of her time. He also calls attention to a neglected phase of Wordsworth's career and topic in his poetry. Whether or not Walker's term "indifference" is widely adopted or Wordsworth's 1820 "third volume" becomes a popular focus of study, all Romanticists will find valuable insights in this book. It is an important and genuinely original work, demonstrating the author's impressive erudition and skillful handling of textual, historical, biographical, and theoretical material. Beth Lau, Professor of English at California State University, Long Beach, is the author of Keats's Reading of the Romantic Poets (1991) and Keats's Paradise Lost (1998) and editor of the New Riversides edition of Sense and Sensibility (2002). Her latest book is an edited collection of essays, Fellow Romantics: Male and Female British Writers, 1790-1835 (Ashgate, 2009). My thanks to Beth Lau for her characteristically generous account of the book and its attempt to open a new set of lenses on Wordsworth and Austen, coupled. Her work on Austen and especially on Keats has long been an important resource. I'll just add one quibble and one question. Lau's summary implies that Wordsworth's 1820 volume of poetry The River Duddon and the fugitive 1820 "third volume" are the same thing. They are instead discrete bibliographical objects: whereas the "third volume" (a collective binding of four books: Thanksgiving Ode, Peter Bell, The Waggoner, and The River Duddon) survives today in only a handful of copies, The River Duddon volume by itself proved quite popular, and sold very well. Sensationalized by the Reynolds parody, the Peter Bell volume even went into a second edition in 1819, a rare event in the history of Wordsworth's publications. But the point I argue is that, when we take Wordsworth's "third volume" prompt and read these four separate books together as an add-on to the 1815 Poems, then--and only then--they come into collective focus as a book of marriage--a book, moreover, that is not only bibliographically but culturally elusive. Now to a question. In the book's last chapter, I float an argument that Wordsworth's 1819 blank verse lyric "To _____" is, among many other things, a dialogic response to Keats and the infamous "Hymn to Pan" recitation (Haydon's "pretty piece of paganism" episode). Lau's silence on this topic in the review suggests that I was less than persuasive, but I'd still be curious to know what a blue-ribbon Keats scholar such as Lau thinks of this new way of reading Wordsworth and Keats in dialogue. Eric Walker is correct about my comments on what Wordsworth called his "third volume." At times, my review suggests that this "volume" is solely the 1820 River Duddon collection rather than this plus three other books published since 1815. But Walker's description of this admittedly elusive and unusual work or conceptual object might have been clearer and might have appeared sooner than pages 66-67, where the chief explanation of the "third volume" occurs. Up until this point, references to Wordsworth's "third volume" left me wondering what exactly it was. A fuller explanation furnished earlier in Walker's study would have been helpful. Nonetheless, my own summary of the "third volume" could have been clearer and more precise, and for this lapse I apologize and stand corrected. Walker kindly asks for my reaction to his argument that Wordsworth's "To _____" is in part a dialogic response to Keats's "Hymn to Pan" from Endymion, which Keats recited to Wordsworth in January 1818, as well as to other poems in Keats's 1817 volume, an inscribed copy of which he gave to the elder poet. Aptly noting in his book that too much emphasis has been placed on their initial meeting in the winter of 1817-1818, Walker directs our attention to what he calls "fugitive forms of companionship" (203) between the two poets in 1820: Wordsworth inquired about Keats in a January 1820 letter, and Keats was invited to dine in company with Wordsworth when the latter was in London in June 1820, though Keats was too ill to attend. Walker's suggestion that we consider Keats's influence on Wordsworth rather than vice versa is also welcome and provocative. I nonetheless have some reservations about his particular claim that Wordsworth's "To _____" shares language with Keats's "Hymn to Pan" and poems from the 1817 volume. First, I wonder if Wordsworth would have closely recalled specific phrases from the "Hymn to Pan" on the basis of one recitation. Second, the copy of his 1817 Poems that Keats gave to Wordsworth purportedly remained "uncut and unread . . . on Wordsworth's shelves" (Aileen Ward, John Keats: The Making of a Poet [New York: Viking, 1963] 155). Walker's argument for "To _____" as a dialogic response to Keats is intriguing and plausible, but further evidence of Wordsworth's familiarity with the Keats poems in question would have made it more convincing for this reader. Leave a comment on Beth Lau's review.